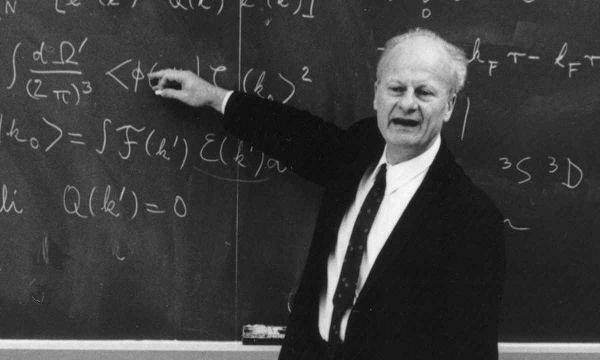 An émigré from Nazi Germany, Hans Bethe joined Cornell's physics department back in 1935. There, he built a remarkable career for himself. A nuclear physicist, Bethe made key contributions to the Manhattan Project during World War II. After the war, he brought stellar young physicists like Richard Feynman from Los Alamos to Ithaca and turned Cornell's physics department into a top-notch program. In 1967, he won the Nobel Prize for "his groundbreaking work on the theory of energy production in stars." Lecture 1: Here Bethe "introduces quantum theory as 'the most important discovery of the twentieth century' and shows that quantum theory gave us 'understanding and technology.' He cites computers as a dramatic realization of applied quantum physics." Lecture 2: "By the 1920s, physicists were driving to synthesize early quantum ideas into a consistent theory. In Lecture 2, Professor Bethe relates the exciting theoretical and experimental breakthroughs that led to modern quantum mechanics." Lecture 3: In the last lecture, "Professor Bethe recalls work on the interpretation of the wave function, the Heisenberg Uncertainty Principle, and the Pauli Exclusion Principle. He shows how quantum theory forced discussion of issues such as determinism, physical observables, and action-at-a-distance." You can watch an introduction to the lecture series here. You can also find Bethe's lectures listed in our collection of Free Online Physics Courses, part of our collection of 825 Free Online Courses. it just great and powerful.